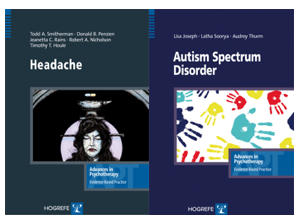 The latest editions of the Advances in Psychotherapy – Evidence-Based Practice Book Series (Hogrefe Publishing) include Autism Spectrum Disorder and Headache. Autism Spectrum Disorder (Vol. 29, 2015) by Joseph, Soorya, and thrum (ISBN 978-0-88937-404-1) is a straightforward yet authoritative guide to effective diagnosis and empirically supported treatments for autism spectrum disorder (ASD). The book starts by reviewing DSM-5 and ICD-10 diagnostic criteria, current theories and models, and prevalence rates for ASD and related neurodevelopmental disorders. It explains the differences between the disorders and changes in criteria and names (such as Asperger’s syndrome, childhood and atypical autism, pervasive developmental disorder, Rett’s syndrome) over time. It then provides clear guidance on evaluation of ASD and comorbidities, with practical outlines and examples to guide practice. Headache (Vol. 30, 2015) by Smitherman, Penzien, Rains, Nicholson, and Houle (ISBN 978-0-88937-328-0) describes the conceptualization, assessment, and evidence-based behavioral treatment of migraine and tension-type headache – two of the world’s most common medical conditions, and also frequent, highly disabling comorbidities among psychiatric patients.